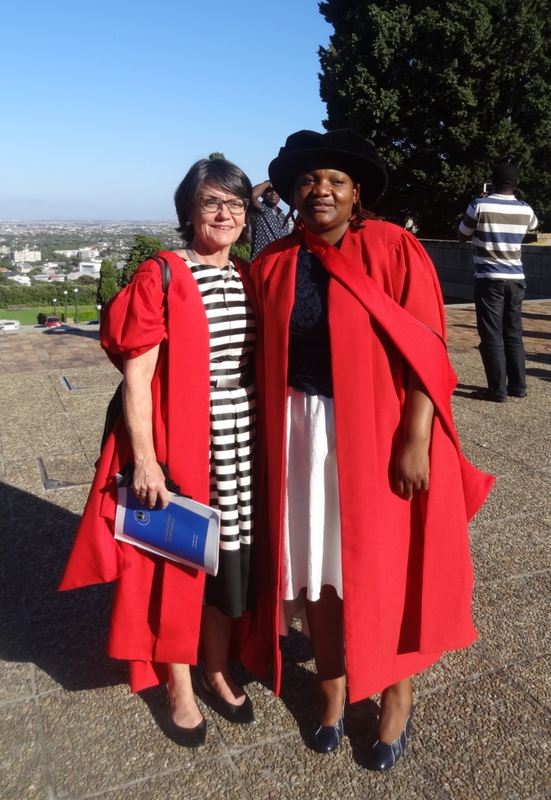 On 20 December 2016, Cecilia Matanga graduated from the University of Cape Town, Faculty of Commerce, Degree of Doctor of Philosophy in Business Administration, programme on Managing Infrastructure Reform and Regulation, under the supervision of Prof Alison Gillwald. As part of the IDRC sponsored initiative to build African ICT policy skills, and in remembrance of RIA partner Amy Mahan, in 2010 Cecilia Matanga was awarded a scholarship to undertake her PhD in the area of ICT policy and regulation in Africa. Amy ran Communica together with Bruce Girard and co-ordinated global south umbrella network, under which DIRSI, LIRNEasia, and RIA fell. Committed to understanding how ICT could be used for social and economic inclusion Amy was a rich resource and friend to RIA prior to her untimely death in 2009. Cecilia Rudo Matanga’s thesis emerged out of her work on the United Nations Department of Economic and Social Affairs Africa i-Parliaments Action Plan and prior to that the Southern African Development Community Parliamentary Forum (SADC PF) where she was responsible for building parliamentary capacity for ICT sector reform. It was here she became aware that the extensive literature on conditions under which Information Communication Technologies (ICT) reforms can accomplish positive public policy outcomes pays little attention to the role of parliaments in these reforms. Contextualised in the specific political and economic circumstances of two of the most dynamic ICT markets in sub-Saharan Africa, the thesis examines the role of the parliament plays in two countries pursing the orthodox ICT reform model, with quite different outcomes. It does so by locating parliament in a conceptual framework that combines the concept of ICT as a complex ecosystem with that of a constellation of institutions, the interplay among which influences reform outcomes. From the rich evidence gathered the comparative case study reveals parliament as more than a neutral, legal structure. Rather it serves as a significant power broker that reflects the competing interests at play. The findings provide an understanding of important structural and institutional constraints on parliaments that, though country-specific, can be theorised to explain poor parliamentary outcomes in many developing countries and nascent democracies.